At first glance, it might sound too demanding and overwhelming to completely refurbish your home office in order to get some quality work done. Since you use it for work and as the main source of your livelihood, you should have everything neat and sorted out. It can be hard to sit down and think about what goes where after years of stuff being piled up. Here are a few ideas on how to organize your office and make it more efficient without being lost in the sea of paper and files. Start off by cleaning the entire office, from windows to floors. Make it clean so that you can have an insight into the things that you need and the ones that you don’t want. Relocate family photos, magazines, and souvenirs from the desk. Get rid of any items that might be distracting or negative. For instance, you definitely don’t need a TV or a treadmill next to your desk. Constant noise and buzzing will make you nervous, and they will stop you from fulfilling your duties on time. Even though you are working from your home, it can be hard and tedious to constantly sit in one place. Getting a quality seat support will most surely boost your productivity. If you have a plain wooden chair without any support, it can take a toll on your back and health. Get a comfortable seating support and you will start enjoying your work even if you get engrossed with tons of it. There are probably more things on your desk and around the office then you need and use. Many Aussies tend to get attached to certain items even though they don’t use them anymore and they only get cluttered. If you happen to have an old shelf, used desk or dated sofa from your grandmother that doesn’t serve any purpose, have them renewed or replaced. You can rely on companies such as Man and His Van for example, to pack and remove your belongings in a storage. They would do all the heavy lifting and you can then later focus on getting new furniture and revamping the space. Start with little things and categorize your working materials first. Put everything in its place and don’t have tons of pens and papers all around. Have a special shelf for storing assignments, letters, and projects, and label everything with a good label marker. Sort out the content in one desk drawer and throw out whatever is no longer useful, and put important files and bills in a plastic organizing tray. Also, get a trash basket, recycling container or a shredder to toss away the finished or unnecessary papers and documents. To double up your work efficiency, place your desk and chair next to a window in order to get the natural sunlight in. If your lamp is too bright or too dim to work under it, then you won’t get sufficient work done. Depending on how spacious your home office is, you can get multiple light features or a simple put quality LED desk lamp. Good lighting will prolong your productivity since you would be able to work adequately even in the evening. On the other hand, if you are constantly in front of the computer, just use optimal brightness. To get the maximum work done, the simplest organizational thing is to set clear working hours. You might be working from your home, but you should start off at 8 in the morning and have the “regular” working timetable. Don’t try to blend the personal life with your work, and when you close the office door make sure that you do all the work, and later do the house chores. Another great idea is to utilize your wall space. Whether you have a small or a big office, you can always go up. You waste valuable time when you have to root through your desk and search around. Use your wall space to hang filing system, a whiteboard, and calendar. Keep most important things always close by, put a shelf beside your desk to put a file holder or a dictionary. You will get things done more efficiently if your supplies are by your side. Firstly, unplug your house phone during the day and turn down your mobile phone ringer. Next, you should also organize your computer or laptop by creating a clear filing system. Have one main folder, for clients, one for tax documents and bills, and one for personal items. Organize your email, update your antivirus and always try to backup the files. Conduct regular maintenance check on your printer and on other gadgets. 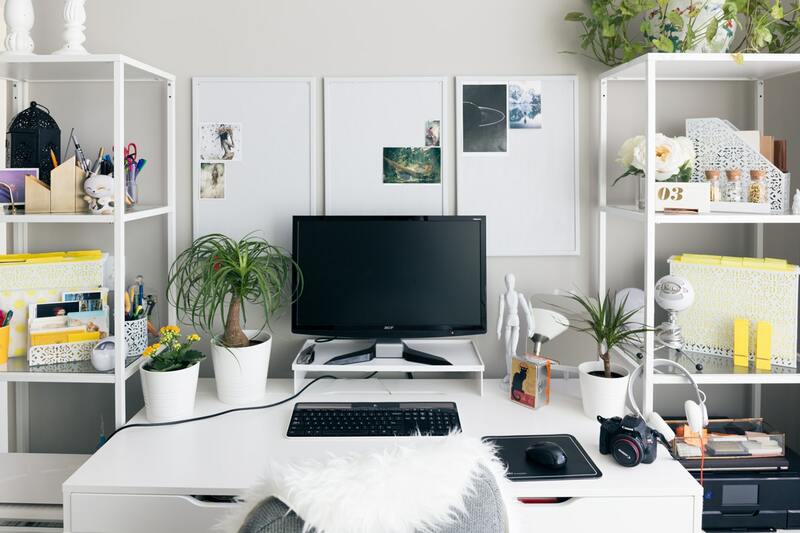 It might be time-consuming to organize your home office, however, once you have put an effort into doing so you would have a beautiful and productive area.